The Civic Long Weekend to me always means one thing…OUTDOOR MUSIC FESTIVAL. Over the last three years, I have been to Osheaga (x2) and Lollapalooza (x1) to fulfill my concert-going needs (and as an FYI, I am very needy when it comes to checking out live music). Now while Toronto does not have it’s own 3-day music festival over this weekend, they have been able to secure some great acts (maybe the bands passing through between Osheaga and Lollapalooza?) and have made mini-music festivals instead. One of these festivals being The Grove. 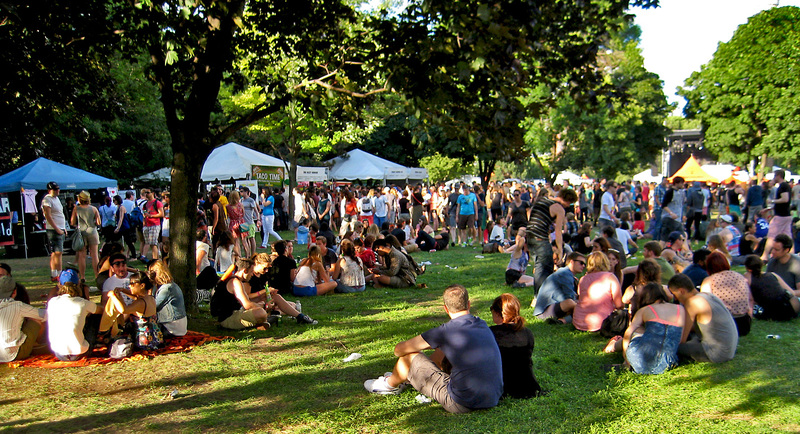 The Grove Festival was conceived through a partnership between powerhouse promoter Goldenvoice and Canada’s indie music label, Arts & Crafts. When the plan to have this festival first came into fruition, it was to be held in Niagara-on-the-Lake and was to feature top acts such as Girl Talk, Phoenix and Macklemore & Ryan Lewis. Not sure if these acts were too large for the small community of Niagara-on-the-Lake, but a couple of months after tickets went on sale, the concert was relocated to the Fort York Garrison Common in Toronto (which also caused for a shift in talent as Macklemore was suddenly dropped from the bill – not that it mattered so much to me as I was going to see Girl Talk anyway). The Grove Music Festival was an all-day affair – Doors opened at 1:30 pm with the last act ending the show at 11 pm. We arrived just after 6 pm to get a lay of the land and to secure our position in front of the stage for Girl Talk. For those of you not familiar with what Girl Talk is, he is actually a DJ from Pittsburgh who is best known for his mash-ups of 80’s and 90’s pop songs with the latest chart topping R&B and rap hits. He also has the same birthday as me which I just found out through Wikipedia. Not sure you needed to know that, but I thought it was rather interesting and decided to share. Go Scorpios! The Grove Festival seemed like any other music festival I have been to – just on a much smaller scale. They had the typical beer tents and food stations set up, as well as the necessary stage (what would a music festival be without the stage?). However, one thing I noticed that was lacking was the sound. All the acts leading up to the headliner were…what’s the word…QUIET. I could barely make out what some of the songs were that were being played, and I was not terribly far from the speakers. Luckily this was resolved in time for Phoenix’s performance at the end of the night, but for the fans that came out to see Girl Talk and Hot Chip – we were a little disappointed. All-in-all, we had a great time at the event. While the Grove Festival cannot compete with the big guys Osheaga and Lollapalooza during this weekend, it was nice that Toronto had it’s own little festival during this time. I am curious if we will see more things out of this festival in the future.